9 8 • O U T PA T I E N T S U R G E R Y M A G A Z I N E • O C T O B E R 2 0 1 8 W hen I was a kid growing up in Los Angeles, there was a television show that I loved to watch: the original Divorce Court. You see, at the time, California required grounds for divorce, and the show prof- fered up titillating tales of deceit. But just across the border in Nevada, one could quickly obtain "residency" and snip marital ties on a whim. Just like a 1960s Reno divorce, earlier this year, Olean (N.Y.) General Hospital ended its 24-year marriage to Southern Tier Anesthesiologists. We still love you, but, we're in love with someone else who spends less on clothes stipends. Apparently, it was the "for richer or for poorer" part of the marital vows that pushed the hospital over the edge. 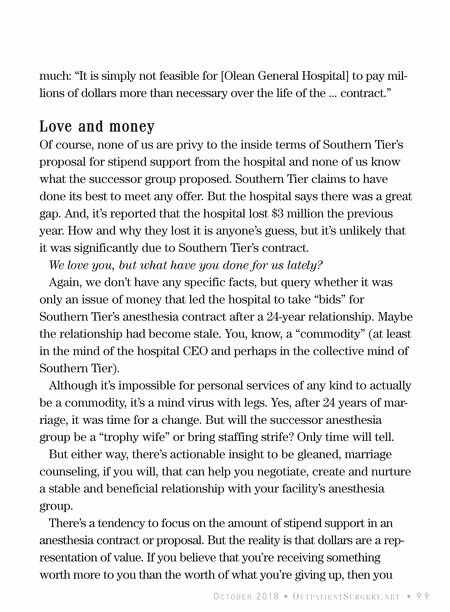 According to a letter obtained by the Olean Times Herald, Olean General Hospital stated that Southern Tier's bid for the renewal contract would have cost it too In or Out of Love With Your Anesthesia Group? Before you switch providers, consider the true cost of divorce. 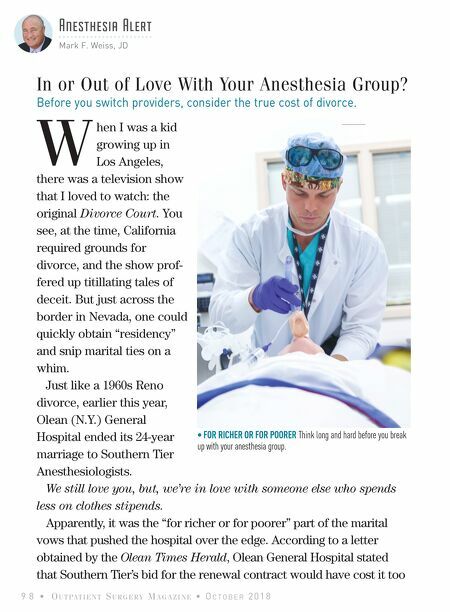 Anesthesia Alert Mark F. Weiss, JD • FOR RICHER OR FOR POORER Think long and hard before you break up with your anesthesia group.